and to love our neighbors as ourselves! It isn't feel-good advice. These are commandments from our Lord and Savior. It isn't even difficult! But, so many people have never even tried to fulfill this repsonsibility. Yes - it is a responsibility. Jesus told us the burden was light. Matthew 11:30 For my yoke is easy, and my burden is light. In faith, we have to make a commitment to obey these commandments. We will feel joy, live more productively, encourage others and have hope! Get started today! Read the Bible and see how Jesus intends for us to live! 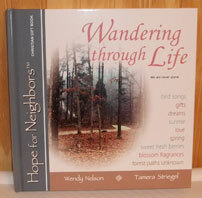 Buy the Hope for Neighbors book, "Wandering through Life," for yourself and give it to family, friends, co-workers and neighbors! We can influence those around us and give Glory to God!